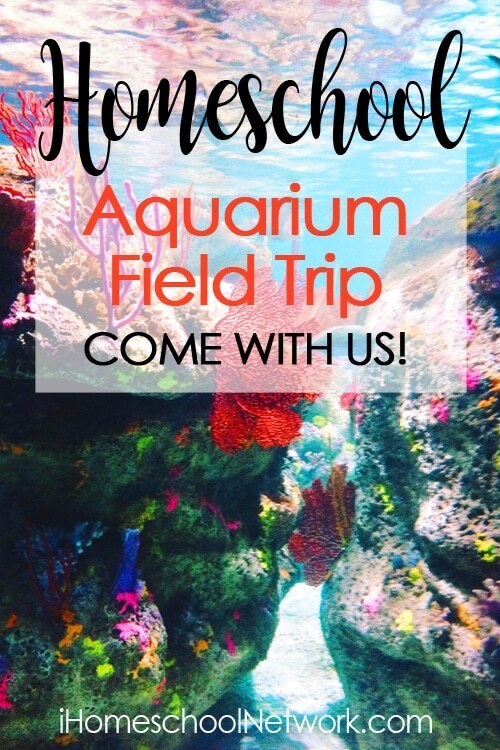 Homeschool Aquarium Field Trip: come with us! Want to go on a field trip with us today? I’ll be fun, and won’t cost you a thing. About a year and a half ago, we relocated from the Atlanta area to a little town on the coast of North Carolina. We absolutely love it, and one of the reasons we do is the abundance of outdoor fun and nature study opportunities that abound. 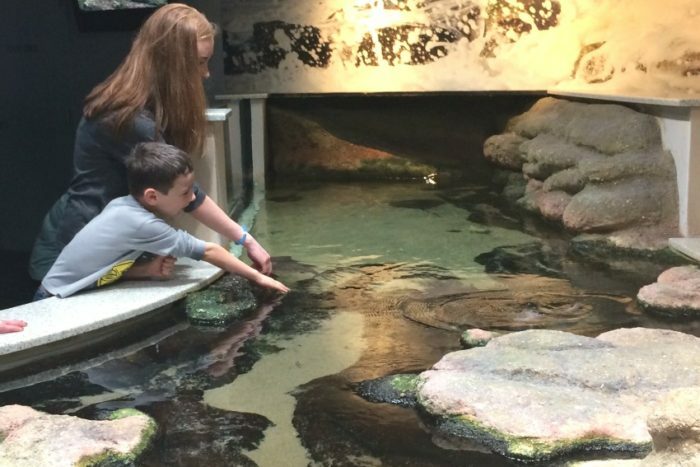 Today, we’re taking a nature-themed field trip, but it’s indoors — to the North Carolina Aquarium at Fort Fisher. It’s not a huge aquarium like the one we used to go to in Atlanta, but we enjoy it and go often enough to make it worthwhile to have a family membership. Getting there starts with a ferry ride! My teen driver has already navigated this several times, whereas I never drove on a ferry until we moved here. 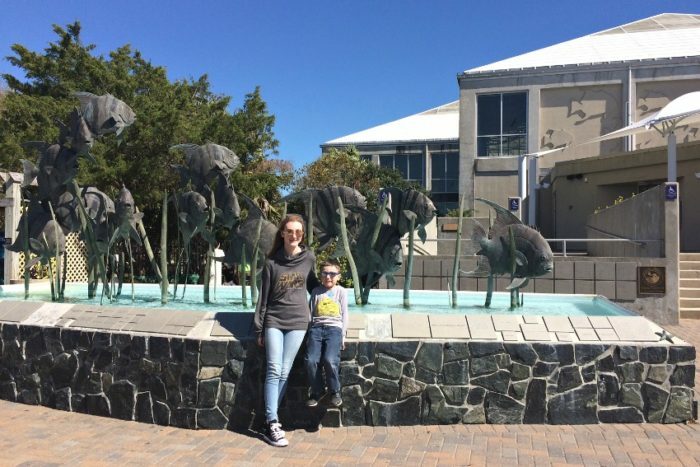 After a relaxing half-hour ride across the Cape Fear River — with dozens of seagulls hitching a ride and hoping for someone to toss them a cracker — we arrive at Fort Fisher and make the short drive to the aquarium. I’ve been homeschooling since my teen was in kindergarten; now a high-schooler, she still enjoys field trips and having her 8-year-old brother along gives 16-year-old Kathryn an excuse to enjoy things in a different way than if it was just the two of us. She even posed with her head in the alligator’s mouth, too, but I’d be in big trouble if I posted that one anywhere online! Nature study: local plants and wildlife. The first part of the aquarium is a large atrium with native plants and animals throughout. 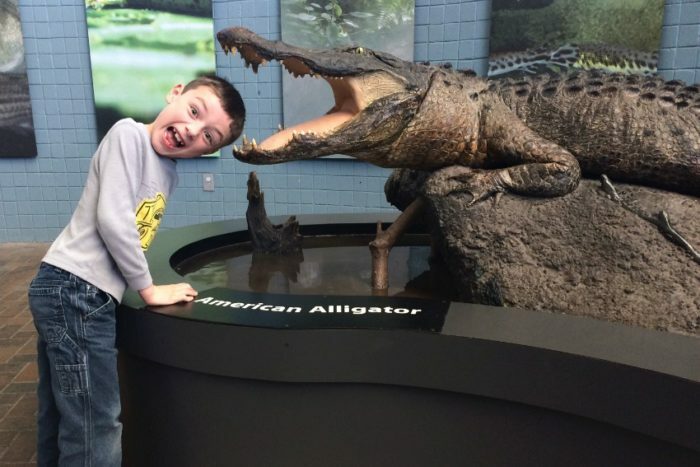 There are tanks of fish you’d see if you could peek into the black rivers in our area; a corner with Eastern Box turtles roaming free; a bald eagle who cannot be released due to a seriously damaged wing; and several alligators, including Luna the albino. 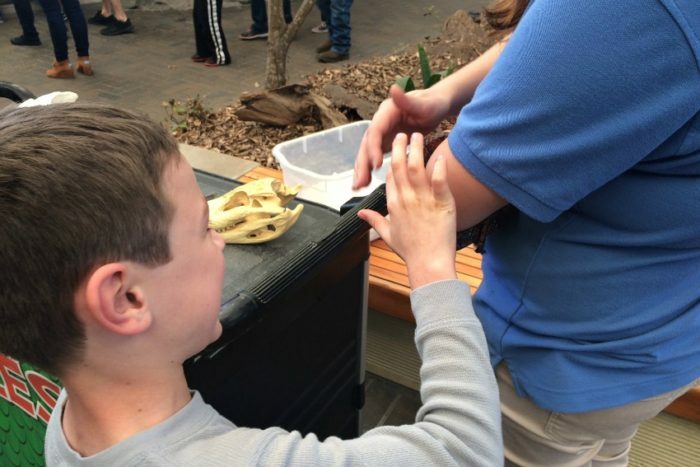 On this visit, kids have an opportunity to touch a live corn snake and learn the difference between it and the visually similar but venomous copperhead. Once we move through the atrium, we come to an area with another tank of fish, little turtles, and even tiny blowfish! Each year the Aquarium takes in two loggerhead turtle hatchlings, then releases them the following summer. We got to see one of these young loggerheads, which was extra neat for us since we see then as tiny babies when we work as volunteers with our island’s sea turtle program. 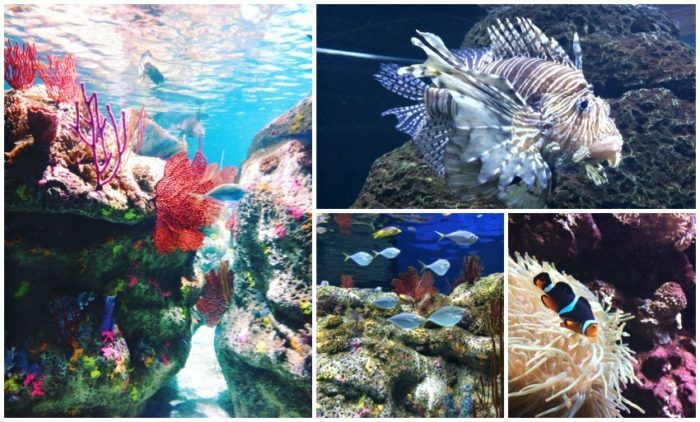 Further on in the aquarium, we get to the tanks of moon jellyfish, colorful coral and tropical fish, gigantically creepy lobsters, lion fish, and more. There’s a replica of a megaladon jaw where kids can pose for a photo, and a room with jaws of numerous types of sharks. We hadn’t realized sharks had so many different kinds of teeth! 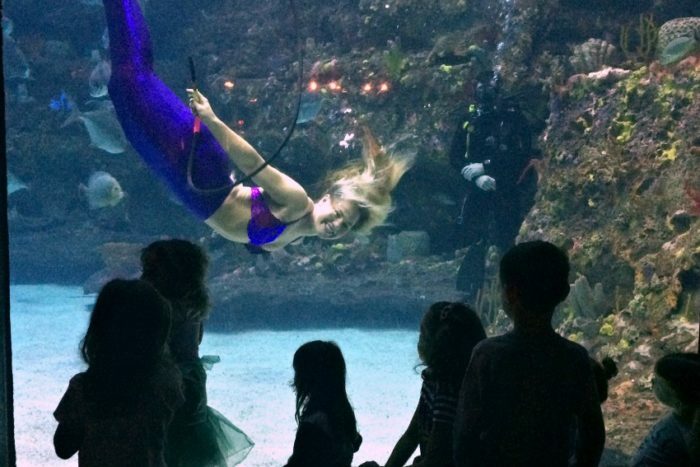 On this visit, there are special visitors at the aquarium in the main tank: the Weeki Wachee Mermaids! The mermaids wave, blow bubble heart rings, and swim surrounded by rays, sharks, a green sea turtle, plus huge grouper and other fish. Although he knows the mermaids use oxygen to breathe, my boy is duly impressed. We continue on through the exhibits, learn about the highly endangered vaquita porpoise, touch a bamboo shark in another touch-tank, and spend a little time on the playground, and eat our packed lunches. We talk about when the butterfly exhibit will re-open, and we meander through the boardwalks and natural outdoor area on our way to the car. 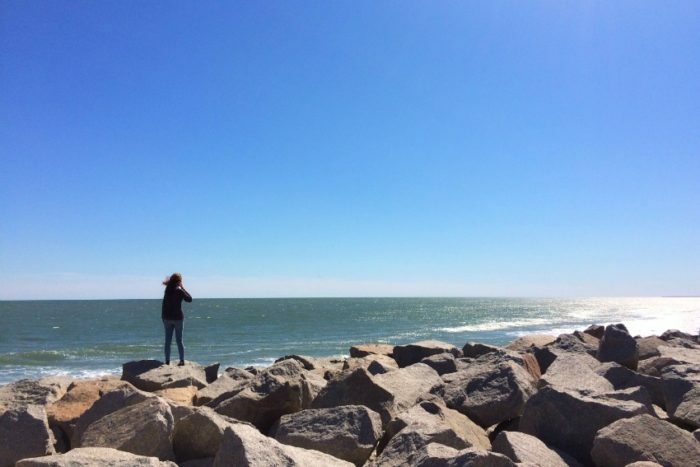 We decided it’s too beautiful a day not to stop for at least a few minutes at Kure Beach, where the water always seems to be so blue! Then it’s time to head back to catch the ferry home, and enjoy another seagull-accompanied ride across the river. Thanks for coming along with us; find me for homeschool and mom life on instagram, and stop by my blog anytime! Introvert addicted to tea, books, & sunshine. Homeschooler, dog wrangler, adoptive mom, and fitness enthusiast.